In my mind, if we were meant to stay in one place we would have roots instead of feet. My trip to the Grand Canyon was an experience I can never forget. Seeing it for the first time made me realise you cannot take in the Grand Canyon in a single view. 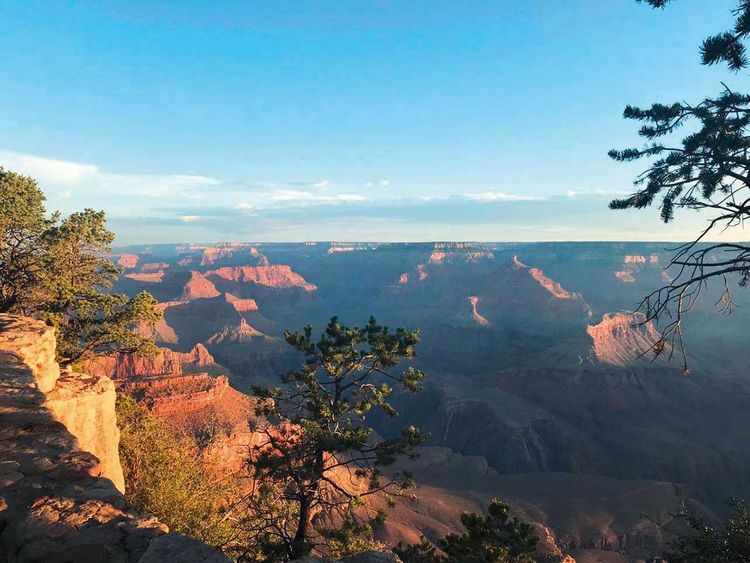 To really earn the full view of the Grand Canyon, you need your eye to work through a host of observations. Words and pictures cannot do justice to the sights I saw. The sunrise, of course, was the best part. That sunrise felt like a fresh start. Almost like a brand new pencil on an empty page. The reason why this has been my favourite trip so far is, how far the horizon of my thoughts expanded. There was something about the silence that made it feel as if time has stopped or the world had gone back a few decades. It felt surreal. It also made me realise silence is not quiet, but full of answers for those who try to listen. Sitting on the edge of the cliff while feeling the sunlight against my skin felt revitalising. I looked down and saw the sapphire river flowing and shimmering under the sun. Looking at that sight made me think of how we sometimes get lost in the flow of this frantic race we call life and don’t appreciate the simple things in life anymore. Simplicity isn’t about perfection, it’s about intention. We also hiked along the south rim of the canyon at the break of dawn. It was the small things that made it memorable. Such as hearing the rocks shift under my feet with every step I took and also feeling the wind through my hair. With every step, I looked up at the alluring sight in front of me only to be speechless once again. Another thing I noticed was, it was completely natural and man had no contribution to make to this piece of heaven on earth. It felt good to get away from the city rush and noise for once and to feel so connected with nature. It was proof that not all beautiful things ask for attention. Even now as I look at the pictures I took, each one tells a story, at least to me. It made me realise we take photographs as return tickets to moments otherwise gone. Sometimes, all we need is nature, a campfire and our thoughts to create a beautiful tomorrow.